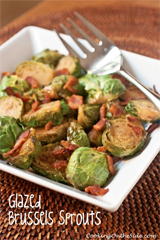 I couldn’t resist – a recipe like this begs to be tried, don’t you think? This 9-Layer No-Bake Matzo Cake is only half as tall as it was supposed to be. The original recipe, from the back of a box of Manischewitz matzo, called for a whopping 18 layers of chocolate covered matzo, sandwiched with almond-laced whipped cream, espresso-spiked chocolate mousse and crunchy chopped almonds. Look at that. It’s quite the behemoth – about 12 inches tall, extrapolating from how high my short stack reached. The recipe called it a “S’more Cake”, but with the absence of both graham crackers and marshmallows, that seems like a bit of a stretch. Whatever you want to call it, it would be quite the conversation piece at a Passover seder, to say the least! And, fortunately, much of the conversation would also center around how surprisingly tasty it is. A challenge to serve, yes (easiest to serve it a layer at a time), but it’s actually kind of delicious. This is a no-bake cake, so most of your time will be spent in preparing and assembling the layers. 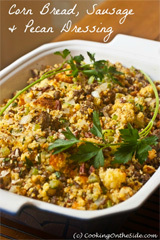 As I mentioned before, there are some complex flavors going on in this otherwise simple dish. The dark chocolate is combined with espresso powder to enhance the chocolate flavor. And there’s almond extract mixed in with the whipped cream to keep things even more interesting for your taste buds. I found the easiest way to spread the chocolate on all of the sheets of matzo was to just pour a bit onto the center and then spread it around with an offset knife. 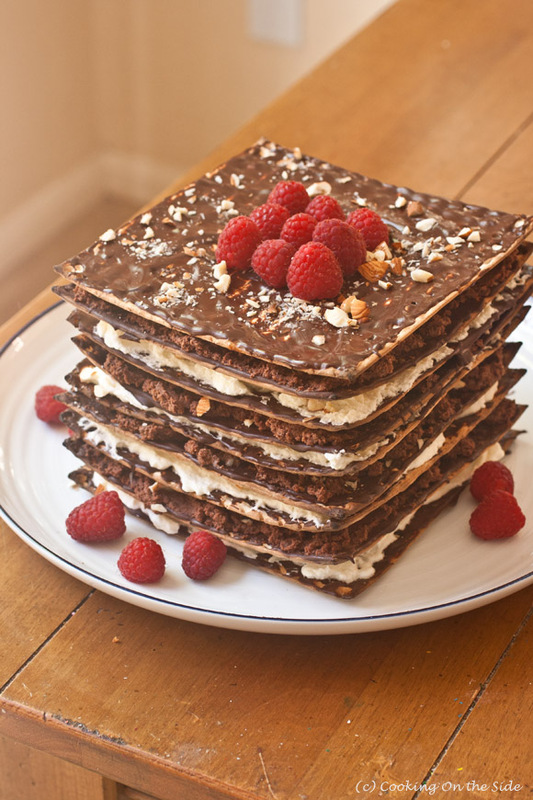 I actually ended up assembling each layer separately, topping the chocolate-covered matzo with either whipped cream or chocolate mousse and then chopped almonds, and then stacking the layers on top of each other. 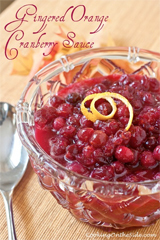 The recipe was very simple and straightforward – BUT – I did still manage to mess up one step. The recipe says to mix 1/2 cup of the melted chocolate in with the whipped cream, to create a mousse-like mixture. Well, my eyes must have skimmed past the word “cup” and I mixed in half of all the chocolate – which was well more than 1/2 cup. All in all, it wasn’t a big deal – my mousse was a bit thicker than it probably should have been, and I wound up with 9 layers rather than 18. Believe me, it was plenty. But I hope at least one of you will build the full tower and report back! Add the ground espresso to the melted chocolate; mix well. Set aside. Using the beater attachment of your mixer, whip the topping as you slowly add the sugar and almond extract and form soft peaks. Separate half the whipped topping into another bowl. Add about 1/2 cup of the cooled, melted chocolate into one of the whipped topping bowls. Gently fold the chocolate into the topping using a rubber spatula. 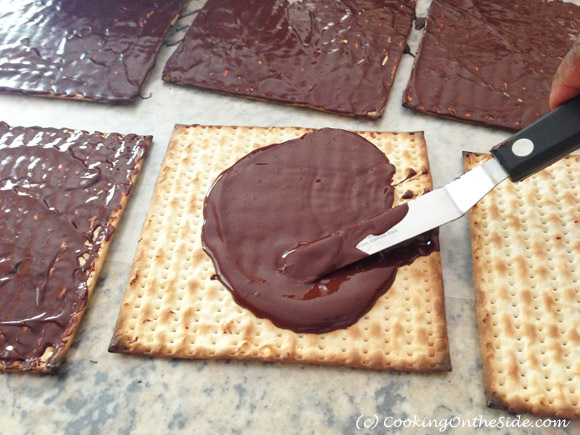 Using a pastry brush or a knife, shmear a layer of the melted chocolate onto the top of each matzo square. 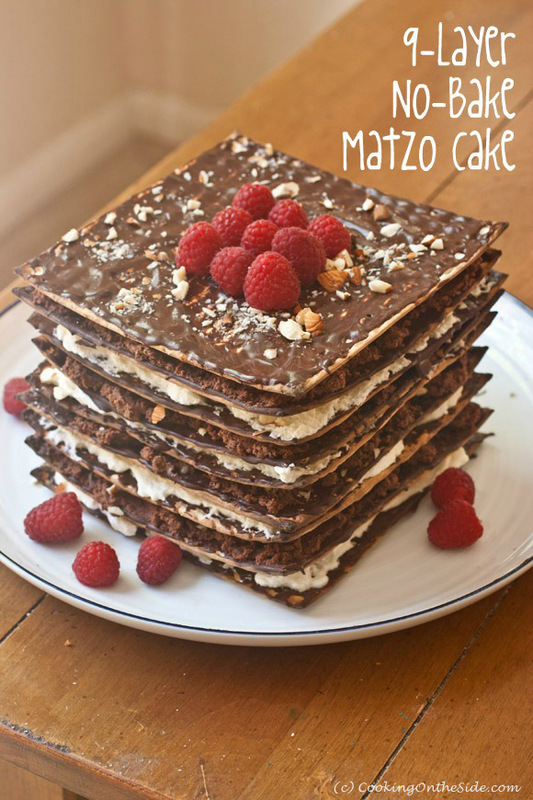 Layer each chocolate covered matzo with whipped topping, alternating between the white topping and the chocolate topping. 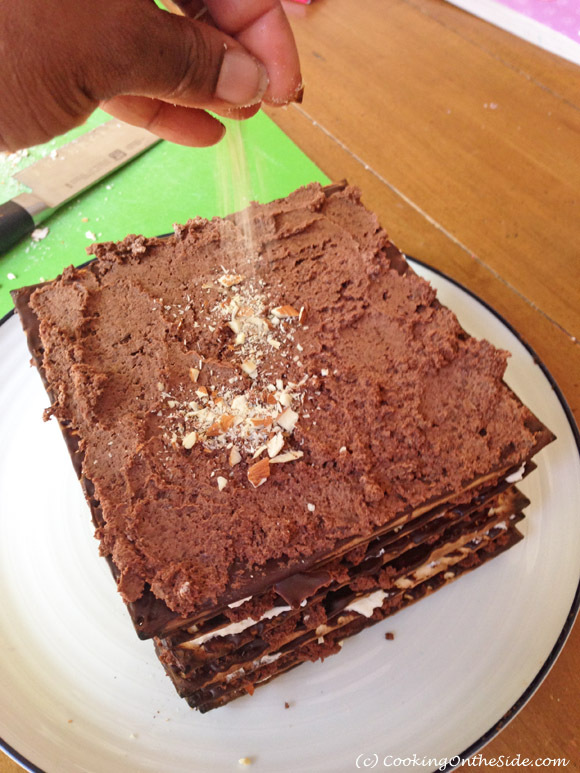 Sprinkle chopped almonds over each layer before adding the next chocolate covered matzo. Repeat until you have come to the last piece of matzo. Garnish the top of the cake with shaved white chocolate, fresh berries and any leftover chopped almonds. Refrigerate for up to two hours before serving. * Alternatively, you can use 2 cups of heavy whipping cream in place of the non-dairy whipped topping, and increase the sugar to 1/2 cup. That said, if you’re observing kosher Passover laws and serving meat for your main meal, you’ll want to stick with the non-dairy approach. 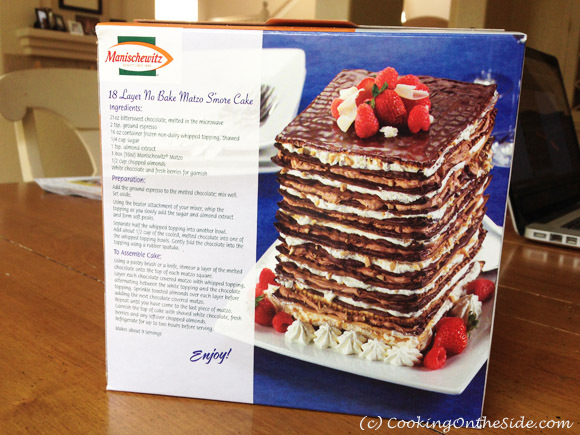 Oh wow… I never would have thought to make the recipe from the back of the box, but it looks freakin amazing! What a cool idea Kathy! It looks so easy and delicious! I just read through this recipe and I think it would be a lot better if its made into individual cakes. matzo can be difficult to work with when trying to ‘cut’ into this cake. Its very crumbly leaving a huge mess and the flavors to seperate from their layers. Id suggest cutting the matzo into evenly cut squares and then assembling the different layers. Each individual square would be much smaller but composed of all the flavor components. This should rid the problem of the mess, waste, and most importantly the complex elements of this cake. That’s definitely one good approach. I didn’t attempt to cut it at all, just lifted off layer by layer. The only problem with lifting it layer by layer is that not each layer has all the flavors. You lose huge components of this cake that way. What a fun idea and super impressive too! Thanks, for posting this! I must have missed this recipe somehow, but am marking it to try next year for Passover! Wow, that is one giant tower of chocolatey goodness. Yum!! Is the whipped cream supposed to soften the matzo, like in a graham cracker ice box cake? Hi Karla – No, it doesn’t soften the matzo. The matzo is covered with chocolate and remains crisp. This looks great but how in the world would you cut it? Wouldn’t it just be a crumbly gooey mess and impossible to actually serve to guests? Whoops… guess I should have actually read the post! I see you served it layer by layer. Does still look like it would be messy, but certainly does look delish! I’m going to make this but soften the matzah with some grape juice before covering it with the chocolate. I’m also going to add some margarine to the chocolate so it doesn’t harden all the way. That should make it easier to cut and eat. If you briefly soak each matzo layer they’ll get soft enough to cut through but will still retain their structure. Fill a rimmed baking sheet with Manischewitz, add one matzo when it comes time to add the whipped cream and nuts to each layer, and by the time that’s done (~30 seconds), remove the matzo with tongs, shake it out gently, then stack it. Repeat for each layer. Works beautifully and everyone was very impressed!